I’ve been using the “Grandma Maroni’s” meatball recipe for quite some time now. I just love it. Grated Romano cheese, onions and herbs are all mixed up in the meatball. These meatballs have the best flavor. 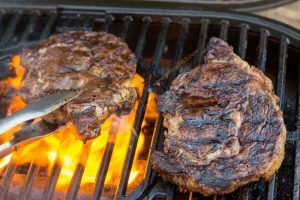 I decided to test out this recipe on the charcoal grill. I was thrilled to learn that it works great and was really easy to pull off. 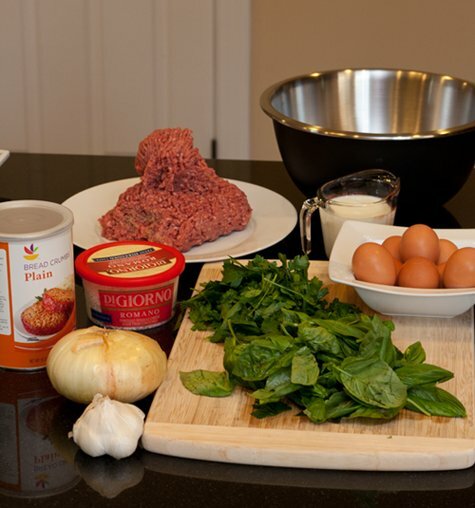 This grilled meatballs recipe works great for a meatball sub or for spaghetti! 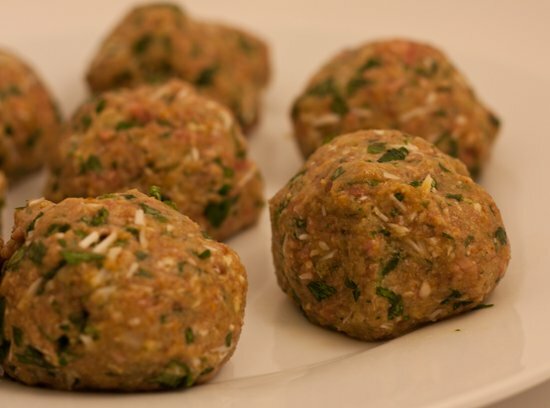 One of the big fusses with the Grandma Maroni meatball recipe is that the measurements are by weight not volume. This becomes troublesome for those with no kitchen scale. It also becomes troublesome because some of the measurements don’t seem to make sense. For example the original recipe says “2 oz of chopped parsley.” That’s a lot of parsley! I always ended up eyeballing the recipe using only a fraction of what is actually called for. If you want to read more about this check out the main food network recipe and read through the comments section. You’ll see pure confusion! Anyway, I decided to write up the version of the recipe that works out well for me and best yet it doubles as a fantastic grilled meatball recipe! 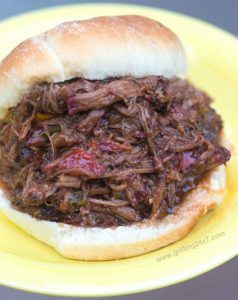 I find this recipe the easiest when I use my food processor. Rough chop the onion (about 1/2 cup), take the skin off of about 1/4 cup of garlic (about 6-8 cloves, or 2 oz if you want to measure) and toss it into a food processor and pulse. Do not over pulse or the onion will get too wet, which will cause you to have a wet meatball. Next, scrape out the onion, remove the leaves from the parsley and basil and toss them into a food processor and pulse. 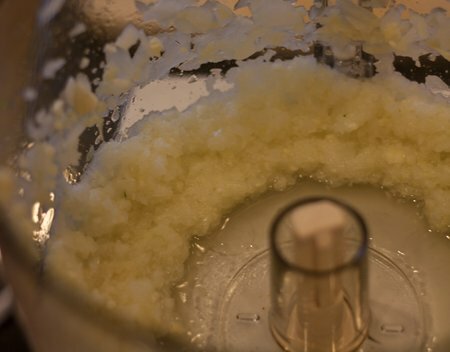 If you don’t have a food processor just finely chop it all with a knife. After everything is finely chopped toss it into a big bowl with the rest of the ingredients. 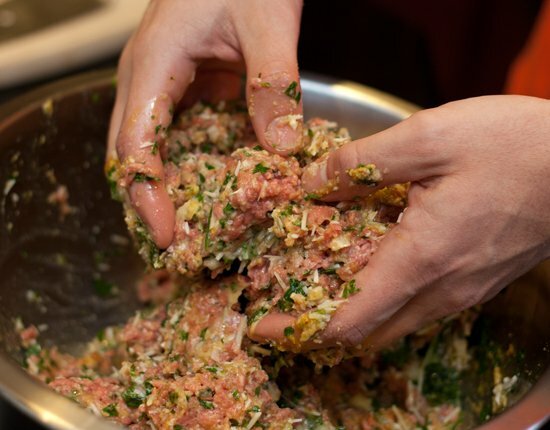 The key with any meatball recipe is to very carefully and lightly mix everything together. It’s almost like a light toss rather than a rough mix. If the mix is too wet add some extra bread crumbs. Don’t pack everything together really hard of you’ll have dense meatballs. You want them to be light and fluffy. If the mix seems too wet add some more bread crumbs. Once everything is mixed together lightly form meatballs in your hand. The size is really up to you but remember that bigger meatballs take longer to cook. 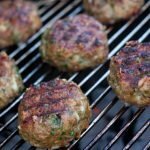 Once the meatballs are made they can be stored in the fridge for as long as you like (within reason) until it’s time to prepare the grill. You want to cook them throughout but you don’t want to burn the outsides. 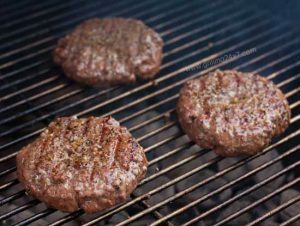 I prefer a medium heat spread out all over about 3/4 of the grill. This works out to be about 3/4 of a charcoal chimney lit and dumped out evenly around the grill. Don’t have a high temperature or you’ll have meatballs with a rare inside and crisp outside. Not good! Since the meatballs are fragile I take some oil, wet a paper towel, and rub the grates to clean them and to help things not stick. I’ve had zero problems with meatballs sticking to the grates but this is an extra safety measure. You are also more likely to stick if you have a wet meatball (see note about extra bread crumbs above). When the fire is ready grill the meatballs for about 10-15 min. Don’t be afraid to check after 8 min. You don’t want a burnt meatball. Flip the meatball over when one side of the meatball looks like the photo below. You can use tongs or a spatula, whichever you feel more comfortable with. 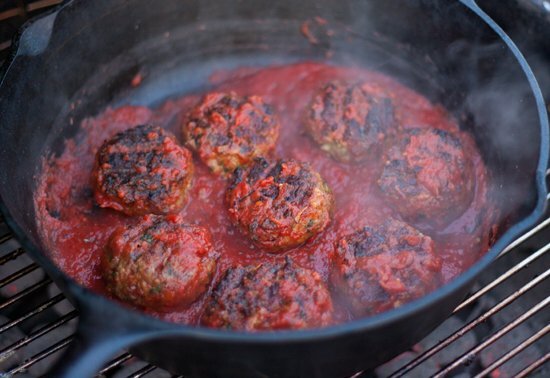 After the meatballs are grilled move them to indirect heat and get out a cast iron skillet. Fill the skillet with your favorite pasta or pizza sauce. You can obviously make your own sauce like I do but that recipe will come out another day. Put the skillet over direct heat and add the meatballs. Toss them around a bit to let the flavors of the meatballs extend out into the sauce. 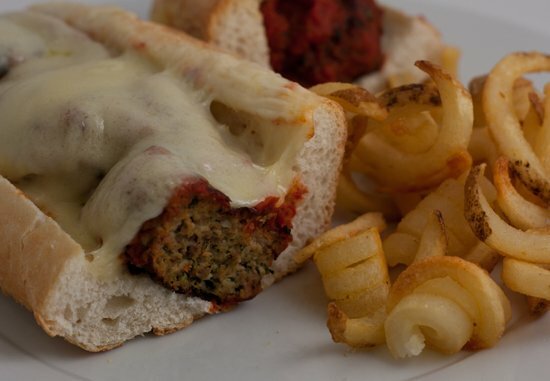 I chose to make meatballs subs with my grilled meatballs. Fantastic! Notice the Philly Amoroso roll with melted provolone cheese. I also added some baked curly fries as a side dish. Oh man! 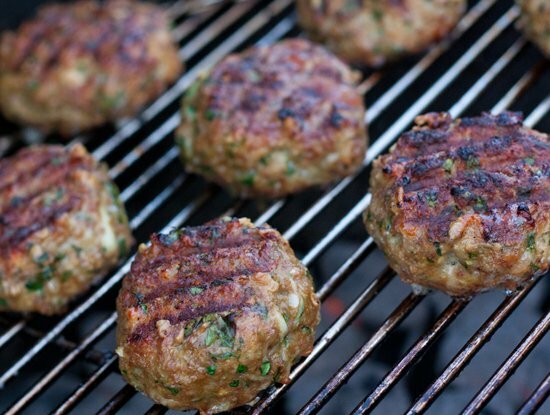 Grandma Maroni’s famous meatball recipe modified for the grill. Rough chop the onion (about 1/2 cup), take the skin off of about 1/4 cup of garlic (about 6-8 cloves, or 2 oz if you want to measure) and toss it into a food processor and pulse. Do not over pulse or the onion will get too wet, which will cause you to have a wet meatball. 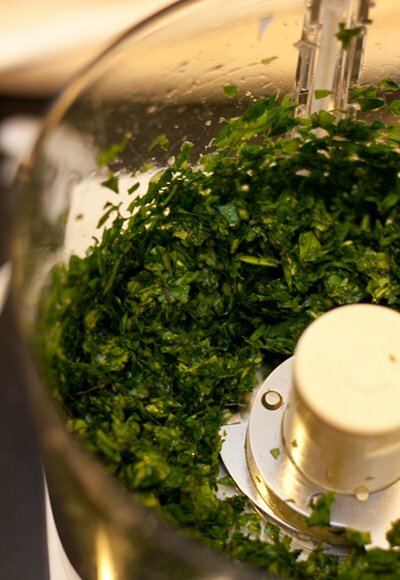 Next, scrape out the onion, remove the leaves from the parsley and basil and toss them into a food processor and pulse. If you don’t have a food processor just finely chop it all with a knife. Once the meatballs are made they can be stored in the fridge for as long as you like (within reason) until it’s time to prepare the grill. You want to cook them throughout but you don’t want to burn the outsides. I prefer a medium heat spread out all over about 3/4 of the grill. This works out to be about 3/4 of a charcoal chimney lit and dumped out evenly around the grill. Don’t have a high temperature or you’ll have meatballs with a rare inside and crisp outside. Not good! Since the meatballs are fragile I take some oil, wet a paper towel, and rub the grates to clean them and to help things not stick. I’ve had zero problems with meatballs sticking to the grates but this is an extra safety measure. You are also more likely to stick if you have a wet meatball (see note about extra bread crumbs above). When the fire is ready grill the meatballs for about 10-15 min. Don’t be afraid to check after 8 min.